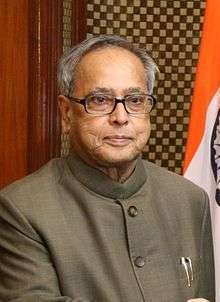 Pranab Kumar Mukherjee (Bengali: প্রণব মুখোপাধ্যায়) (Bengali: [prənəb kʊmɑr mʉkhərdʒi]; born 11 December 1935) is the 13th and current President of India, in office since July 2012. In a political career spanning six decades, Mukherjee was a senior leader of the Indian National Congress and occupied several ministerial portfolios in the Government of India. Prior to his election as President, Mukherjee was Union Finance Minister from 2009 to 2012, and the Congress party's top troubleshooter. Pranab was born in a Bengali Brahmin family in Mirati in the Birbhum district of Bengal province (now in West Bengal). His father was active in the Indian independence movement and was a member of West Bengal Legislative Council between 1952 and 1964 as a representative of the Indian National Congress and was the member of AICC. His mother was Rajlakshmi. Mukherjee's political career began in 1969, when he managed the successful Midnapore by-election campaign of an independent candidate, V. K. Krishna Menon. Then Prime Minister of India, Indira Gandhi, recognised Mukherjee's talents and recruited him to her party, the Indian National Congress. He became a member of the Rajya Sabha (the upper house of Indian parliament) in July 1969. Mukherjee was re-elected to the house in 1975, 1981, 1993 and 1999. Mukherjee became a Gandhi loyalist, and is often described as her "man for all seasons". Mukherjee's rise was rapid in the early phase of his career and he was appointed Union Deputy Minister of Industrial Development in Indira Gandhi's cabinet in 1973. Mukherjee was active in the Indian cabinet during the controversial Internal Emergency of 1975–77. Ruling Congress politicians of the day including Mukherjee were accused of using extra-constitutional powers to "wreck established norms and rules of governance". Following the Congress's defeat in the 1977 general elections, the newly formed Janata government-appointed Shah Commission indicted Mukherjee; however, the commission was itself later indicted for stepping "outside its jurisdiction" in 1979. Mukherjee emerged unscathed and rose through a series of cabinet posts to become Finance Minister from 1982 to 1984. His term was noted for his work in improving the finances of the government that enabled Gandhi to score a political point by returning the last instalment of India's first IMF loan. As Finance Minister, Mukherjee signed the letter appointing Manmohan Singh as Governor of the Reserve Bank of India. Mukherjee was sidelined from the INC following the assassination of Indira Gandhi. Although Mukherjee was much more experienced in politics than Indira's son, Rajiv Gandhi, it was Rajiv who gained control. 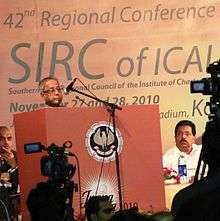 Mukherjee lost his position in the cabinet and was sent to manage the regional West Bengal Pradesh Congress Committee. He had considered himself to be Indira's likely successor and, siding with those within his party who aligned themselves against Rajiv Gandhi, Mukherjee was eventually expelled. Dr. Manmohan Singh appointed Mukherjee as the Minister of Defence of India when the Congress came to power in 2004. Mukherjee held the post until 2006. He expanded co-operation with the United States during his tenure. The Times of India reported on the Wikileaks cables release and noted how " United States is full of praise for the "uniformed leadership" of Indian armed forces, especially Navy, as well as ministers like Mukherjee." Mukherjee in June 2005 had inked the 10-year Indo-US Defence Framework deal. Mukherjee has thrice served as Commerce Minister of India. His first stints were in the Indira Gandhi government from 1980–82 and again in 1984. His third stint in the 1990s saw him contribute significantly to the negotiations leading to the establishment of the World Trade Organisation. Prime Minister of India Narendra Modi greets Pranab Mukherjee. His elder son, Abhijit Mukherjee, is a Congress MP from Jangipur, West Bengal. He was elected in the by-polls held after his father vacated the seat. Before his election, Abhijit was an MLA from Nalhati in Birbhum. Honorary Doctorate from the University of Calcutta in 2014. Finance Minister of the Year for Asia (2010; by Emerging Markets, the daily newspaper of record for the World Bank and the International Monetary Fund|IMF]]). ↑ "Protocol to keep President Pranab off Puja customs". Hindustan Times. 11 October 2011. Retrieved 12 July 2012. ↑ "Who is Pranab Mukherjee?". NDTV. 15 June 2012. Retrieved 11 July 2012. 1 2 3 4 5 "Biography". Pranab Mukherjee. Archived from the original on 4 September 2010. Retrieved 11 July 2012. ↑ "About Pranab Mukherjee" (PDF). Europe.eu. 22 June 2012. Retrieved 11 July 2012. 1 2 3 4 5 6 7 8 9 10 11 "Shri Pranab Mukherjee". Government of India. Archived from the original on 2011-05-14. Retrieved 11 July 2012. ↑ "Tehelka - India's Independent Weekly News Magazine". Retrieved 29 June 2015. 1 2 3 4 "FM Pranab's first priority: Presenting budget 09-10". The Indian Express. 23 May 2009. Retrieved 23 May 2009. 1 2 3 "Footsteps of Pranab". Mathrubhumi. 29 June 2012. Retrieved 11 July 2012. 1 2 3 4 "Pranab Mukherjee's USP for President: sheer experience". ibnlive. 4 May 2012. Retrieved 11 July 2012. ↑ "The tallest short man". Sumit Mitra. The Hindustan Times, 26 February 2010. Retrieved 27 February 2010. 1 2 3 4 "The Pranab Mukherjee Budget". Business Standard. 22 February 2010. Retrieved 8 August 2010. 1 2 3 4 "Pranab Mukherjee – The 13th President of India". Zee News. 22 July 2012. Retrieved 22 July 2012. 1 2 3 "I won't be a unique President: Pranab Mukherjee". Zee News. 24 July 2012. Retrieved 9 August 2012. ↑ "Why is Dr Singh Sonia's choice?". Rediff. 19 May 2004. Retrieved 10 August 2012. 1 2 "Pranab Mukherjee's exit from party politics is a loss and an opportunity". The Economic Times. India. 4 July 2012. Retrieved 13 July 2012. ↑ "India's new foreign minister Mukherjee: a respected party veteran". Agence France-Presse. 24 October 2006. Retrieved 9 April 2007. ↑ "India gets new foreign minister". BBC News. 4 October 2006. Retrieved 9 April 2007. ↑ GK Gokhale (19 April 2004). "Why is Dr. Singh Sonia's choice?". rediff.com. Retrieved 9 April 2007. ↑ Aditi Phadnis (29 March 2005). "Pranab: The master manager". rediff.com. Retrieved 9 April 2007. 1 2 3 4 "The Man Indira Trusted". India Today. 16 October 2010. Retrieved 9 August 2012. ↑ "Cabinet Secretariat, Government of India". Retrieved 1 May 2012. ↑ "US preferred Pranab Mukherjee over AK Antony as defence minister". Times of India. 6 September 2011. Retrieved 12 July 2012. ↑ "Russia to remain India's topmost defence partner". Times of India. 15 November 2005. Retrieved 9 August 2012. 1 2 "Russia Hails Defence Cooperation With India". Spacewar. 15 November 2005. Retrieved 9 August 2012. ↑ Biswas, Soutik (14 October 2005). "India's architect of reforms". BBC News. Retrieved 11 December 2008. 1 2 3 "Finance Minister of the Year 2011". The Banker. 23 December 2010. Retrieved 23 July 2012. ↑ Bamzai, Sandeep (26 June 2012). "Pranab Mukherjee's stint as Finance Minister clearly wasn't his best". Daily Mail. London. Retrieved 13 July 2012. 1 2 "Finance Minister of Asia award for Pranab". The Hindu. Chennai, India. 11 October 2010. Retrieved 13 June 2011. 1 2 "Pranab Mukherjee resigns as Finance Minister; PM to take additional charge, say sources". NDTV. 26 June 2012. Retrieved 13 July 2012. ↑ Prabhu, Chawla. "Pranab nominated after Mulayam-Sonia secret meet". Retrieved 4 July 2012. ↑ "Hunt begins for head of state". Yahoo News India. 3 January 2012. Retrieved 29 June 2015. ↑ "Pranab Mukherjee, Sangma final candidates for Prez polls". Daily News and Analysis. 4 July 2012. Retrieved 4 July 2012. ↑ "CNNIBN Blog". 22 July 2012. Retrieved 22 July 2012. ↑ "NDTV Blog". 22 July 2012. Retrieved 22 July 2012. ↑ "Fight against terrorism is 4th World War: Pranab". The Hindu. Chennai, India. 25 July 2012. 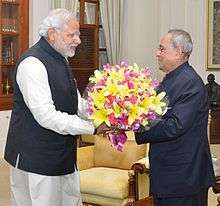 ↑ "PM, Sonia congratulate India's new President Pranab Mukherjee". Zee News. 22 July 2012. Retrieved 1 August 2012. 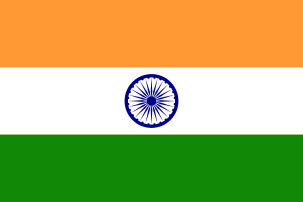 ↑ "India has got a very able president: Somnath". Zee News. 22 July 2012. Retrieved 1 August 2012. ↑ "India needs Pranab as president: Sharad Yadav". Zee News. 22 July 2012. Retrieved 1 August 2012. ↑ "Pranab Mukherjee will be a wise president: Dikshit". Zee News. 22 July 2012. Retrieved 1 August 2012. ↑ "Prez poll: BJP miffed over cross-voting". Zee News. 22 July 2012. Retrieved 1 August 2012. ↑ "Nitin Gadkari congratulates Pranab Mukherjee". Zee News. 22 July 2012. Retrieved 1 August 2012. ↑ "Prez Pranab Mukherjee promulgates ordinance on crime against women". Indian Express. 3 February 2013. Retrieved 4 February 2013. ↑ "President signs ordinance to effect changes in laws against sexual crimes". India Today. 3 February 2013. Retrieved 4 February 2013. ↑ "Yakub Memon and 23 other mercy pleas rejected by President Pranab Mukherjee". 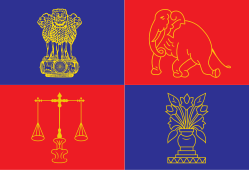 ↑ "President Pranab rejects 12 mercy pleas, a first in India". ↑ "IISS". Retrieved 29 June 2015. ↑ "Pranab Mukherjee's son Abhijit Mukherjee wins Jangipur Lok Sabha seat". The Times Of India. 13 October 2012. ↑ "Pranab Mujherjee's son wants his LS seat, party to take call". 24 July 2012. ↑ Das, Mohua (12 January 2011). "Dancer who happens to be 'his' daughter-Father Pranab Mukherjee misses Sharmistha's tribute to Tagore, mom in front row". Calcutta, India: Telegraph India. Retrieved 22 July 2012. 1 2 "Pranab Mukherjee's Durga Puja at ancestral home". Rediff. 4 October 2011. Retrieved 11 July 2012. ↑ "Padma Vibhushan Awardees for year 2008". india.gov.in. Retrieved 3 April 2012. ↑ Pranab Mukherjee receives Bangladesh's second highest award. NDTV.com (2013-03-05). Retrieved on 2014-05-21. ↑ "President Mukherjee accorded with Grand Cross National Order of the Republic of Cote D'Ivoire". PTI. 15 June 2016. Retrieved 15 June 2016. ↑ "Honorary doctorate for Pranab from UK university". The Hindu. 27 May 2011. Retrieved 13 June 2011. ↑ "Small price for big prize". Calcutta, India: Telegraph India. 15 July 2012. Retrieved 22 July 2012. ↑ "What doctor ordered but can't get at home". Calcutta, India: Telegraph India. 1 October 2013. Retrieved 2 October 2013. ↑ DU honours Pranab Mukherjee. bdnews24.com (2013-03-04). Retrieved on 2014-05-21. ↑ "UOM — HONNEUR: Le Président de l'Inde fait Doctor of Civil Law Honoris Causa" (in French). Le Matinal. 13 March 2013. Retrieved 10 April 2013. ↑ "Shri Pranab Mukherjee". Calcutta Yellow Pages. 22 January 2001. Retrieved 23 July 2012.